Kick off your visit on the 10th (Thu): make a trip to Lombard Street and then get to know the fascinating history of Filbert Steps. 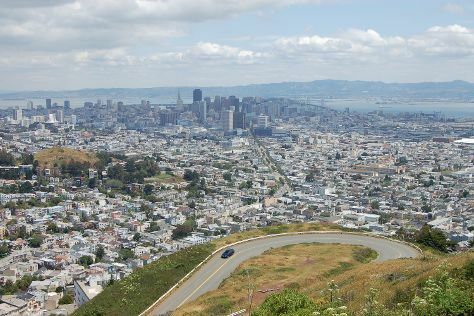 Get ready for a full day of sightseeing on the next day: take in the awesome beauty at Twin Peaks, then take in nature's colorful creations at Japanese Tea Garden, then engage your brain at California Academy of Sciences, and finally wander the streets of Chinatown. 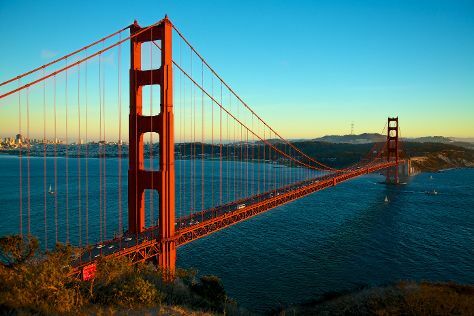 To see traveler tips, photos, and more tourist information, read San Francisco trip tool . Dusseldorf, Germany to San Francisco is an approximately 15.5-hour combination of train and flight. You can also fly; or do a combination of flight and train. The time zone difference moving from Central European Time (CET) to Pacific Standard Time (PST) is minus 9 hours. Plan for somewhat warmer temperatures traveling from Dusseldorf in January, with highs in San Francisco at 17°C and lows at 9°C. Finish up your sightseeing early on the 12th (Sat) so you can travel to Death Valley National Park. On the 13th (Sun), contemplate the waterfront views at Badwater Basin, take some stellar pictures from Dante's View, and then take in the dramatic natural features at Zabriskie Point. For photos, traveler tips, reviews, and more tourist information, use the Death Valley National Park online travel route planner . Do a combination of flight, bus, and taxi from San Francisco to Death Valley National Park in 8 hours. Alternatively, you can do a combination of subway, flight, bus, and taxi; or drive. Plan for slightly colder nights when traveling from San Francisco in January since evenings lows in Death Valley National Park dip to 1°C. Wrap up your sightseeing on the 14th (Mon) early enough to travel to Ridgecrest. Ridgecrest is a city in Kern County, California, United States. Kick off your visit on the 14th (Mon): look for gifts at Red Rock Books, examine the collection at Petroglyph Park, then take in breathtaking views at Little Petroglyph Canyon, and finally take an in-depth tour of Maturango Museum. To see other places to visit, where to stay, more things to do, and tourist information, refer to the Ridgecrest trip itinerary builder site . Traveling by car from Death Valley National Park to Ridgecrest takes 2 hours. In January, daytime highs in Ridgecrest are 19°C, while nighttime lows are 0°C. Finish up your sightseeing early on the 14th (Mon) so you can travel to Grand Canyon National Park. Kick off your visit on the 15th (Tue): hike along Rim Trail, take in breathtaking views at Grand Canyon South Rim, and then look for gifts at Lookout Studio. On the 16th (Wed), you'll have a packed day of sightseeing: trek along Bright Angel Trail. To see reviews, more things to do, photos, and more tourist information, go to the Grand Canyon National Park travel planner. Getting from Ridgecrest to Grand Canyon National Park by car takes about 7.5 hours. Other options: fly. The time zone difference when traveling from Ridgecrest to Grand Canyon National Park is 1 hour. Traveling from Ridgecrest in January, expect Grand Canyon National Park to be slightly colder, temps between 7°C and -11°C. Finish your sightseeing early on the 16th (Wed) to allow enough time to drive to Salt Lake City. Start off your visit on the 17th (Thu): test your team's savvy at popular escape rooms, then learn more about the world around you at Natural History Museum of Utah, then take in breathtaking views at Big Cottonwood Canyon, and finally admire the striking features of LDS Conference Center. To see where to stay, reviews, traveler tips, and other tourist information, read Salt Lake City visit planning app . Getting from Grand Canyon National Park to Salt Lake City by car takes about 8.5 hours. Expect little chillier weather when traveling from Grand Canyon National Park in January: highs in Salt Lake City hover around 3°C, while lows dip to -6°C. Finish up your sightseeing early on the 17th (Thu) so you can travel to West Yellowstone. 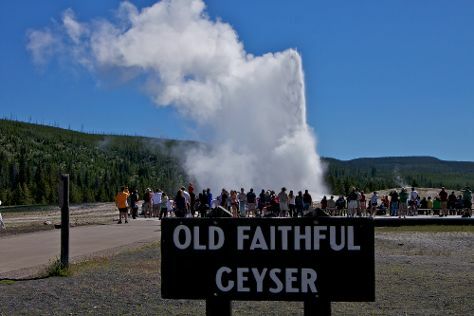 Start off your visit on the 18th (Fri): look for all kinds of wild species at Grizzly and Wolf Discovery Center, witness a stunning natural landmark at Old Faithful, then witness a stunning natural landmark at Lone Star Geyser, and finally take in the natural beauty of Grand Prismatic Spring. To find maps, photos, traveler tips, and other tourist information, read West Yellowstone route site . Getting from Salt Lake City to West Yellowstone by flight takes about 2.5 hours. Other options: take a bus; or drive. Traveling from Salt Lake City in January, you will find days in West Yellowstone are a bit cooler (-7°C), and nights are cooler (-22°C). You will have some time to spend on the 19th (Sat) before leaving for Yosemite National Park. 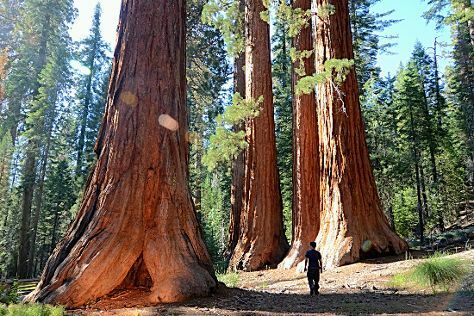 Start off your visit on the 20th (Sun): trek along Mariposa Grove of Giant Sequoias. To see maps, reviews, traveler tips, and other tourist information, read Yosemite National Park trip planning app . You can do a combination of flight, bus, and taxi from West Yellowstone to Yosemite National Park in 10 hours. Alternatively, you can do a combination of shuttle, flight, bus, and taxi; or take a bus. Traveling from West Yellowstone to Yosemite National Park, you'll gain 1 hour due to the time zone difference. While traveling from West Yellowstone, expect much warmer days and somewhat warmer nights in Yosemite National Park, ranging from highs of 7°C to lows of -12°C. Wrap up your sightseeing by early afternoon on the 20th (Sun) to allow time for the car ride to San Francisco. Start off your visit on the 21st (Mon): buy something for everyone on your list at Ferry Building Marketplace, then take in the waterfront at Fisherman's Wharf, then contemplate the long history of Alcatraz Island, and finally snap pictures at Golden Gate Bridge. Get ready for a full day of sightseeing on the next day: wander the streets of Union Square and then engage your brain at Exploratorium. Getting from Yosemite National Park to San Francisco by car takes about 4 hours. Other options: take a bus; or do a combination of taxi, bus, flight, and subway. Traveling from Yosemite National Park in January, expect nights in San Francisco to be much hotter, around 9°C, while days are somewhat warmer, around 17°C. Finish your sightseeing early on the 22nd (Tue) so you can travel back home.